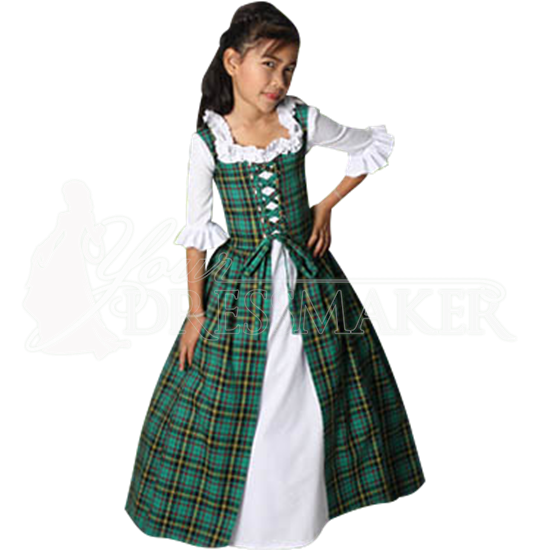 Modeled after traditional Scottish attire, the Girl's Scottish Tartan Dress is a simple dress that is perfect for a wee-small highland lass. This two-piece ensemble is nothing short of utterly adorable, and consists of an under-gown and an over-gown. The under-gown is entirely white, while the over-gown is made from high-quality tartan fabric, which is a blend of cotton and polyester. When worn together, this girls dress is a mix of the checkered pattern of the green tartan accented by touches of white. The neckline is decorated by white ruffled trim, while the mid-length sleeves are fitted to the arm and decorated by flaring, ruffled edges. The skirt is almost-entirely checkered tartan, except for the triangular portion of the under-gown which is visible in the front. The upper part of the Girl's Scottish Tartan Dress is fully-lined. The dress fastens using laces on the front of the over-gown, which allows for a measure of adjustability. Pictured here the dress is worn with a girls petticoat, which gives it shape. Please note that a petticoat is not included with the dress. If the umbrella-shaped look is desired with this dress, then a girls petticoat or hoop-skirt can be purchased separately, otherwise the dress can be worn without either accessory without problem. 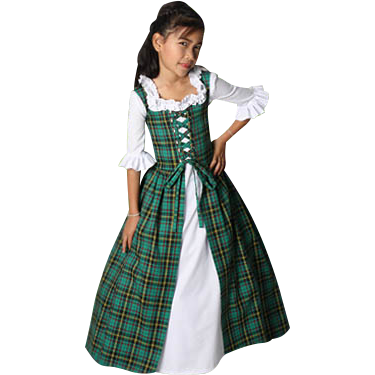 The Girl's Scottish Tartan Dress is an adorable and attractive dress that is great for events that celebrate Scottish heritage. Not only that, but they also look really great at Renaissance fairs, too.